Cyfrowy Polsat Group closed Q 3 2018 with very good operating results in both segments, and delivered strong financial results which reflect a healthy condition of the business. Furthermore, the Group exceeded 14 million contract services provided to its customers and thanks to the consistent multiplay strategy the churn rate was at the record low level. The Group has started monetizing the rights to the UEFA Champions League and generated very good sales results of the Polsat Sport Premium packages. 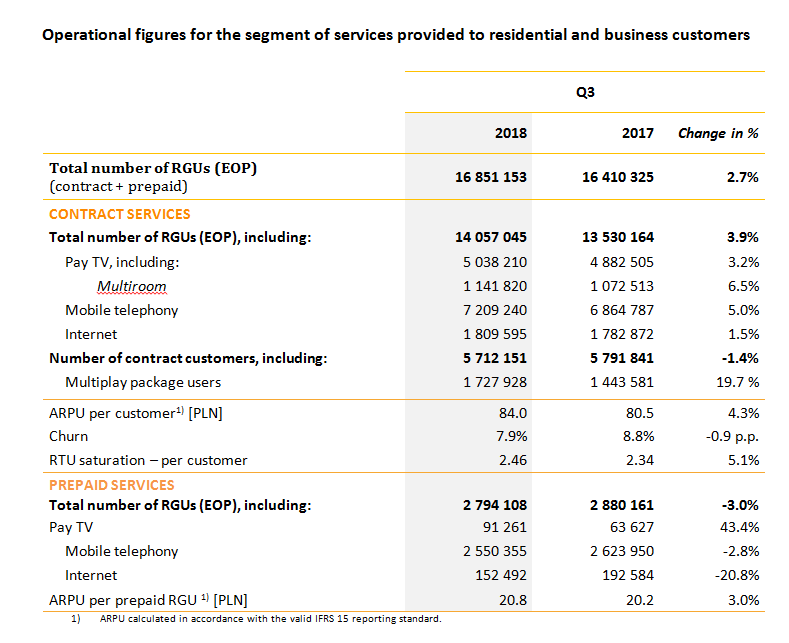 - Systematic growth of the multiplay service customers – up by 284 thousand (20%) YoY to 1.73 million (which constitutes 30% of the contract customer base). - The number of services (RGU’s) used by this group of customers increased to 5.17 million. - The above led to the reduction of the churn rate to the record low level of 7.9% per annum. - Another quarter with growth of the number of mobile voice services – up by 344 thousand YoY, reaching 7.2 million in total. This development is the outcome of the favorable influence of the adopted multiplay strategy, good reception of Plus’s new simple tariffs that were launched this February as well as high sales in the B2B segment (m2m solutions). - Thanks to good sales of basic packages and value-added services (Multiroom and paid OTT services), the total number of contract pay TV services increased by 156 thousand YoY and exceeded 5 million. - Internet access customer base increased by 27 thousand YoY and now stands at 1.8 million. During the first three quarters of this year, retail customers of Cyfrowy Polsat and Plus network transferred ca. 699 PB of data. - RGU saturation per customer increased by 5.1% YoY, with the average number of 2.46 services from the Group’s portfolio per customer. - Average revenue per contract customer (ARPU), as calculated in accordance with the valid IFRS 15 accounting standard, increased by 4.3% YoY and reached PLN 84. - High and stable ARPU from prepaid service, amounting PLN 20.8. 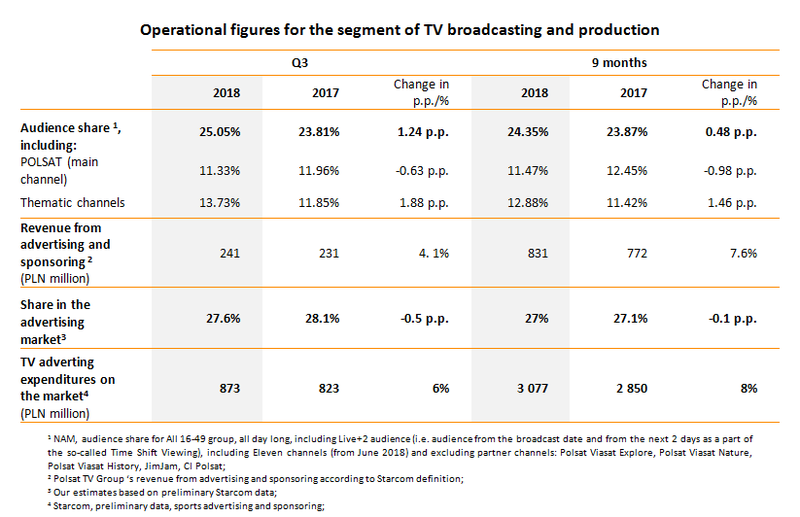 In line with the long-term strategy, Polsat Group’s TV channels continued to stay at the top in terms of audience share in the commercial viewer group, both in Q3 and during the first 9 months of the year, achieving in the former of these periods the audience share of 25.1% (11.3% for the main channel and 13.7% for thematic channels) - in spite of a temporary adverse impact of the coverage of the 2018 FIFA World Cup in Russia which was broadcasted via free-to-air channels of the public broadcaster – and 24.4% for 3 quarters (11.5% for the main channel and 12.9% for thematic channels). Revenue generated by Polsat TV Group from commercials and sponsoring increased by 4.1% YoY in Q3 and reached PLN 241 million, thanks to which the Group’s share in TV advertising market reached 27.6%. During the period of 3 quarters revenue from TV advertising recorded growth by 7.6% and reached PLN 831 million, which have market share of ca. 27%. - Total net debt /EBITDA LTM ratio: 2.83x. “The third quarter of this year is at the same time the first quarter of full consolidation of financial results of Netia and Eleven Sports Network. We have achieved strong financial results which reflect a healthy business condition of the Group and exceeds the average figures from analysts’ forecasts. This is due to very good sales results in both segments and consistent implementation of the multiplay strategy. 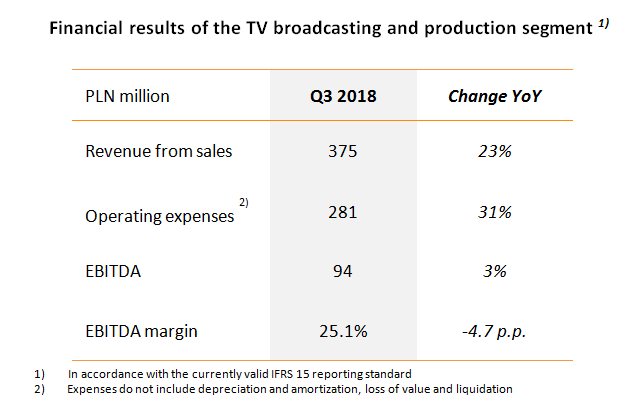 At the same time, adding new TV channels, including premium sport channels, to the wholesale offer had a positive impact on the results of the TV broadcasting and production segment in this quarter. Free cash flows remaining at a high level offer comfort in the pursuit of our business strategy, investment plans and enable us to regularly repay our debt” says Katarzyna Ostap-Tomann, a Management Board Member responsible for finance at Cyfrowy Polsat S.A., Polkomtel Sp. z o.o., Telewizja Polsat Sp. z o.o.